Though his roots in the program don't run quite as deep as his contemporary at the university, Doyt Perry, Harold Anderson arguably means as much to Bowling Green athletics as anybody that has ever been involved with Falcon athletics. Born on September 11, 1902 in Akron, Anderson was a star athlete at Akron Central High School, earning All-Ohio honors in football and basketball, and setting a state record in the low hurdles while a member of the track team. He took that success to Otterbein College outside Columbus and continued to excel. During his college years, he earned 11 varsity letters in four sports for the Cardinals. In basketball, he was named to both the all-conference and all-state teams in 1923 and 1924, earning team MVP honors his senior season. After graduation, he headed to northwest Ohio to begin his coaching legacy on the basketball court. In two years at Wauseon High School he recorded a 24-5 record. The next year, he coached Toledo Waite High School for the first of seven seasons, compiling a 100-33 record at the school, including three city championships and two runner-up finishes in the state basketball tournament. He became the head coaching job at the University of Toledo in 1934, leading the Rockets to a solid 142-41 record in eight seasons, including a third place finish in the 1942 National Invitational Tournament. However after that season, he moved south to take over the coaching duties at rival Bowling Green, though the teams hadn't met on the hardwood since February 26, 1926. Bowling Green was coming off its second straight losing season in the fall of 1942, and Anderson wasted no time in turning that around. The Falcons won their first 14 games under their new coach, finishing the season at 18-5. The next year, the Falcons would finish the regular season at 22-3, earning the school's first bid in the prestigious National Invitational Tournament at the end of the year. Eventual tournament champion St. John's took them out in the first round with a 44-40 win, but the Falcons would be back. The next two years saw return appearances in the NIT, with the 1944-45 team making it to the championship game before falling to future NBA Hall of Famer George Mikan and DePaul, 71-54. The 6-foot, 10-inch Mikan gave all three teams he played in the tournament fits, averaging 40 points a game. The Falcons would make two more visits to the NIT in the next three years, losing in the first round of the 1946 and 1948 tournaments. The second loss came to the eventual champion St. Louis Billikens to finish a season that saw the first matchup with rival Toledo in 22 years. On February 28, 1948, Anderson took his Falcons on the road to face his former team, and came away with a 42-38 victory. The next season, the rivals met twice within a week at the end of the season, with BG again taking a win on Toledo's home floor, but also demolishing the Rockets 86-62 just six days later. The Falcons used that momentum to exact a little revenge on old NIT foes St. John's and St. Louis to reach the semifinals before losing to eventual champion San Francisco. The brown and orange would go out on a winning note, however, beating Bradley 82-77 in the third place game. The next four years saw the program take a downward turn, especially compared to the early success they enjoyed with Anderson on the bench. After an 111-32 win over Tiffin University to open the 1949-50 season, the Falcons finished just 19-11, despite some impressive wins over the course of the year. The next year, Anderson missed 13 games due to health concerns, BG was 10-4 in games Anderson coached, but finished the year with a 15-12 record. The next two years, double-digit numbers continued to appear in the loss column, including a 12-15 record in 1952-53. The first season of the Mid-American Conference in 1953-54 saw Bowling Green get back to their winning ways, as Anderson's Falcons finished 17-7, their 10-3 conference record good for a second place finish, and more importantly, a return trip to the NIT, where they were bumped out in the second round by Western Kentucky. The next season was not so kind, despite splitting the season series with Toledo, the Falcons finished just 6-16 on the year, and a year later, after a 3-3 start, and a win over Arizona in the Kentucky Invitational, the Falcons lost 14 straight games to finish the year at 4-19. Anderson turned it around once again, with three straight winning seasons culminating in the schools first bid to the NCAA Tournament in 1959. The Falcons finished with an 18-8 record that year, and tied Miami(OH) for first place in the MAC, clinching the trip to the NCAA tournament with a 76-63 win over the Redskins in a one-game playoff held in Dayton. Two more losing seasons paved the way for another turn around as Anderson reached the twilight of his career on the sideline. This time, Bowling Green touted one of the nation's top rebounders, and future NBA Hall of Famer Nate Thurmond. In 1961-62, Thurmond and sophomore Howard Komives would lead the Falcons to a 21-3 regular season mark, including an 11-1 conference record. The MAC champions were again invited to the NCAA tournament, but lost to Butler in the first round. The 1962-63 season would be both Anderson and Thurmond's last on the floor at Bowling Green. On February 16, 1963, the Falcons hosted second-ranked and eventual national champion Loyola (Chicago) at Memorial Hall. More than 5,700 fans filled the arena and witnessed possibly the greatest victory in the history of BG basketball, a dominating 92-75 win over the Ramblers. Two nights later, history was made again, as the Falcons posted a 67-68 home win over Notre Dame, the 500th of Harold Anderson's college coaching career. The Falcons would again win the MAC title, with a 9-3 record, and this time they got their first win in the NCAA tournament, beating Notre Dame for the second time in three weeks, 77-72. After a loss to Illinois in the semifinals of the Mideast Regional, the Falcons fell to Mississippi State, 65-60, as the two legends of the Bowling Green basketball program headed off into the sunset. Anderson finished his career at Bowling Green with a 362-185 record, and a 504-226 record overall. He took six Bowling Green teams to the NIT, three more to the NCAA tournament, and on July 1, 1985, he was inducted into the National Basketball Hall of Fame along with his former superstar, Nate Thurmond. On their website, the Hall of Fame honors Anderson by noting that he "gained a solid national reputation for producing consistent teams that played hard, clean and fair basketball." 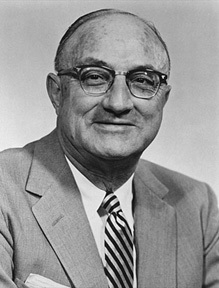 Harold Anderson would coach nine All-Americans (Komives would lead the nation in scoring and earn All-American honors the year after Anderson retired) at Bowling Green, and stayed with the university to serve as Athletic Director in the years following his retirement. The basketball arena was named in his honor in 1963, and he was inducted into the BG Athletic Hall of Fame in 1966. He passed away on June 13, 1967 at the age of 64.